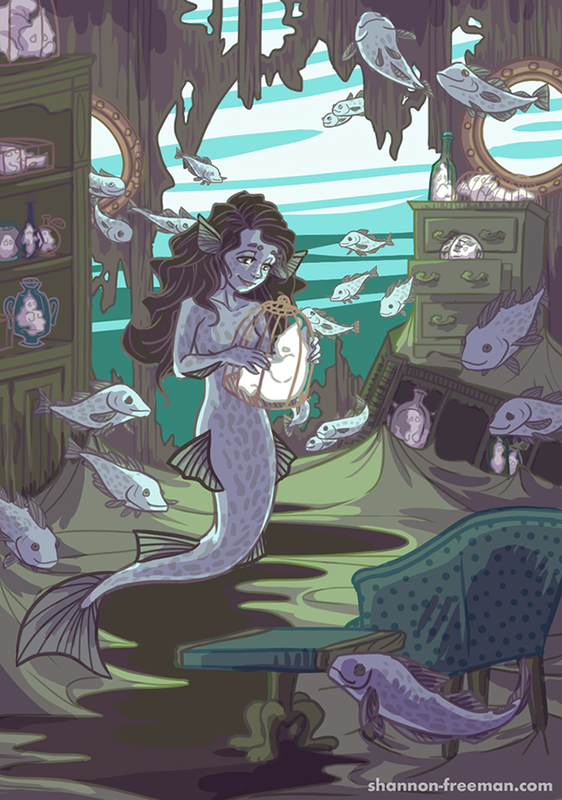 In Irish mythology, a merrow is a beautiful mermaid who collects drowned souls to display in her home. What better home for a merrow than the inside of an abandoned shipwreck? This piece was a lot of fun and allowed me to draw on my own heritage. In the old Irish tale The Soul Cages by T. Crofton Croker, a fisherman is invited beneath the waves to the magical world of merrows. These beautiful, mermaid-like creatures are said to collect drowned souls to proudly display in their home. Well, what better home for a merrow than the inside of an abandoned shipwreck? This piece was a lot of fun and allowed me to draw on my own heritage.